If this card is in your GY: You can send the top card of your Deck to the GY, and if you do, Special Summon this card. You can only use this effect of “Glow-Up Bulb” once per Duel. Glow-Up Bulb is our Thursday Throwback today, and once was an incredibly dominant card. 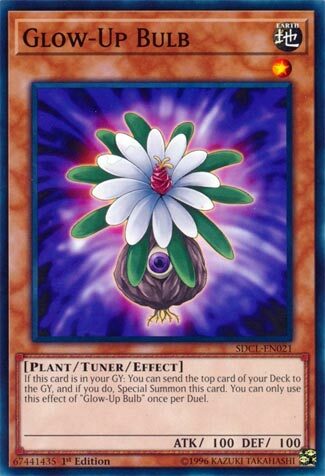 Level 1 Tuner, Special Summon from the grave once via a mill off the top of your deck, not to mention One For One or any Plant-based support resurrection card, Glow-Up Bulb was a mainstay in several decks. Lightsworns stacked Wulf or Felis on top to get a free Special Summon, Shaddoll and Burning Abyss stacked a monster on top to get a grave effect off the Special Summon. Quickdraw Dandwarrior and Plant Synchro would Special Summon this card several times in one turn with their support and with its own effect. Glow-Up Bulb can be run in any deck that Synchro Summons. It is easy to use, summon and Synchro with it, mill and get it back to Synchro again. Now it can be used in aid of Link Summoning and be used for Linkuriboh to start a big turn. With Link Summoning becoming more the norm and Synchro Summoning falling more into the past, this cards use isn’t what it was, but it is still a solid card. Glow-Up Bulb is an old Level 1 Earth Plant-type Tuner monster with 100 Atk and 100 Def. Synchro Climbing used to be more fun, but with the Dawn of Link Format, everything that isn’t Linking is slow or cluttered or both. Glow-up Bulb gained a new best friend in Linkuriboh. 2 Linkuribohs at a minimum from one Normal Summon of Glow-Up Bulb. Sure, it’s no Grinder Golum or Gofu, (excellent Gs for Links…interesting) but it works with One-for-one and plant methods of Special Summoning. In closing, we have a great effect from then, and a good effect now, and probably a good effect later. All that glitters is not not Glow-Up Bulb Gold Rare. Reprints are good. Throwback to a card that finally gets a very easy accessible reprint, Glow-Up Bulb. Bulb here is a Level 1 Earth Plant Tuner with 100 ATK and DEF. The stats are abysmal, the Level is fine for Synchro plays, the type is very well supported, and the attribute is fine. Being a Tuner really helps this card. All Bulb really does is allow you to mill a card from your deck to revive himself from the GY, which is a once per duel effect. This is a very popular Tuner Monster, especially in Link Format. Crystron Needlefiber will be able to summon this card with great ease, along with Aromaseraphy Jasmine, which are both outstanding Link Monsters. This is also a Level 1 for Linkuriboh. This card is popular in Pendulum Magician decks with Astrograph Sorcerer just to spam Omega. This card was once banned and for a reason, it is one of the best Tuners in the game, but it’d be more absurd if it wasn’t a once per duel.